INDIA: Siemens Gamesa Renewable Energy (SGRE) is expanding its scope after being awarded the contract to develop its first hybrid project, to be installed in India this year. The deal was awarded by an unnamed independent operator, SGRE said. It will see SGRE install a 28.8MW solar plant alongside the up-to-50MW wind project in Karnataka state by the end of 2017. It is the first time SGRE will execute such a project, signaling the firm's "determination to explore business opportunities that add value for its customers", SGRE said. "With a market potential of around 15GW in India, our customers are increasingly interested in this type of integrated renewable system," said SGRE India's onshore CEO, Ramesh Kymal. SGRE will be responsible for designing and commissioning the solar plant, with photovoltaic inverters supplied by Gamesa Electric, the firm said. 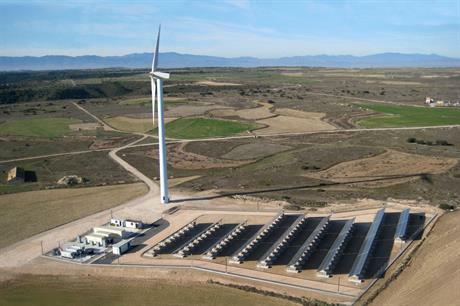 In June 2016, prior to its merger with Siemens, Gamesa installed a 2MW off-grid hybrid prototype project in northern Spain comprising a G52-850kW turbine, 245kW of solar modules, three 222kW diesel generators, and two battery storage systems.